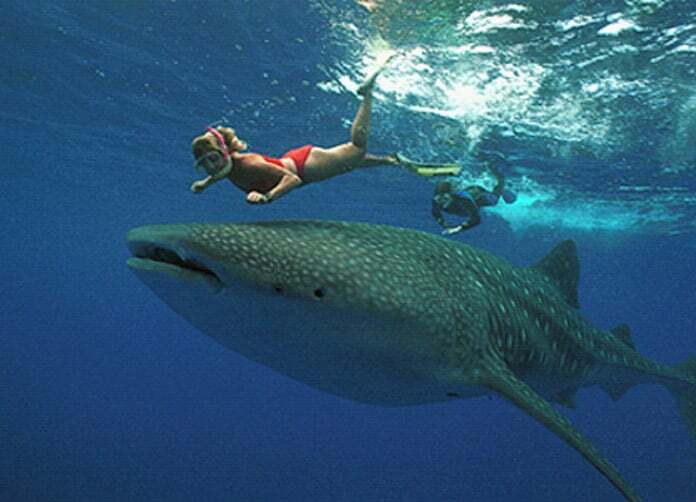 For the ultimate thrill seeker a Cancun Whale Shark tour is unlikely to be beaten. Whale Sharks are the largest fish in the Ocean and between May and September Whale Sharks are found in abundance at the Isla Che Reef, less than an hour boat ride from Cancun. Snorkeling beside these HUGE creatures is a once-in-a-lifetime experience. Whale Sharks are not whales, they are planton-eating sharks (they don’t even have teeth!). The boat takes you out into the ocean where the Whale Sharks are migrating through this area from mid-May through mid-September. Boats hold 10 people so each pair of snorkelers gets 2-3 turns with the Whale Sharks. Don’t miss this opportunity to swim with the worlds largest fish in the ocean. They swim very slowly, no faster than 3mph as they munch their way through 1600 gallons of water an hour sieving out their food, so it is easy for snorkelers to keep up with these giant fish. Our Cancun Whale Shark tour uses a high powered boat, is limited to just ten people per trip and is only available from mid May to mid September. All participants must be able to swim and be 5 yrs or over to snorkel. Each pair of snorkelers gets to go out with the Whale Sharks for 5-10 minutes at a time, until everyone gets a turn. Each person will have 3-4 turns. Not suitable for pregnant women more than 3 months. It can not be 100% guaranteed that you will encounter whale sharks on your tour, however, if you don’t you will be refunded 75% of the cost of your trip. The Whale Sharks move where the plankton moves and are in the open ocean not in a pen. However, GPS coordinates are maintained and along with local knowledge the success rate is very high. Please note Whale Sharks are not aggressive, unless you happen to be plankton or a tiny fish! Transportation is NOT included from Riviera Maya. This can be added at extra cost upon booking.